Seung-Yeob “Steve” Baek (College of Engineering Mechanical & Industrial Engineering) received his B.S. and Ph.D. from the School of Mechanical and Aerospace Engineering at Seoul National University, Korea in 2009 and 2013. Previously, he was a Postdoc Fellow of the President of Korea, a Global Ph.D. Fellowship recipient from the Korean Ministry of Education, and a National Science and Engineering Scholarship recipient. His primary research interests span a broad range of multidisciplinary CAD research, particularly in digital humanity and digital media arts. He has published a number of articles that introduce novel multidisciplinary ideas based on CAD and Computational Geometry theory, and one of his articles was recognized as the by the world’s renowned journal, Computer-Aided Design, in 2012. He has also participated in several new media art projects, in collaboration with New Media Laboratory at Seoul National University, and an interactive media artist group, Everyware. Andrew Casto (School of Art & Art History Ceramics) received his B.A. from Earlham College in Richmond, Indiana, and his M.A. and M.F.A. degrees from The University of Iowa.. He was a 2011-2012 long-term artist in residence, and the 2011 MJD fellow at The Archie Bray Foundation for Ceramic Art in Helena, Montana. He has exhibited work internationally in Spain, Croatia, Italy, Austria, Slovenia, Belgium, China, and Japan. Casto was awarded the second place award in the 2013 VII Bienalle International de Ceramic, in El Vendrell Spain, and the 2010 FuLe Prize by the International Ceramic Magazine Editors Association in Fuping, China. He was recently selected as a recipient of a 2015 Emerging Artist award by the National Council on Education for the Ceramic Arts (NCECA). Jean-François Charles (Music) is a composer, clarinetist, and live electronics designer. After undergraduate studies at the National Institute for Applied Sciences in Lyon, he studied in Strasbourg with the Italian composer Ivan Fedele. He received his Ph.D. in Music/Composition at Harvard. Since 2013, he has been working as deputy director at the Brest Conservatory (Bretagne, France), and has worked with the Ensemble Sillages and the Electrocution Music Festival. In July of 2015, he taught live electronics for music and interactive installations at the Composit music festival in Rieti, Italy. His article “A Tutorial on Spectral Sound Processing using Max/MSP and Jitter” published in Computer Music Journal has helped many electronic musicians integrate spectral sound processing into live performances, compositions, or their own software creations. He is currently developing “Spectral DJ,” an app that gives electronic musicians intuitive access to advanced graphically-based audio effects that expands the possibilities of live sampling and dialog with other musicians. In the next step of his research, he is focusing on interactive machine learning in live performance and improvisation. Daniel Fine (Theatre Arts | Dance) is an artist, scholar, and technologist working in immersive, responsive, mediated environments for interactive users, audiences and live performance. He has designed and directed interactive digital media, projections, and devised new work across the disciplines, as well as designing system integration for theatre, dance, music and art installations, including stereoscopic 3D projection, Virtual Reality, and site-specific locations. 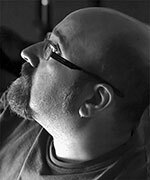 He is the co-author of Digital Media, Projection Design & Technology for Theatre, published by Focal Press, an imprint of Routledge and is a frequent contributor to Live Design Magazine and author of a multi-part blog series on integrating digital media into theatre on Howlround.com. In 2015 Daniel was one of “five visual visionaries” featured in Live Design magazine’s article on What’s Trending in Content Creation. As a fellow at Arizona State’s Center for Science and Imagination, Daniel was recognized as a “creative disruptor driving path breaking research, teaching, and outreach projects… exploding traditional disciplinary boundaries and bringing new audiences into the conversation about building a better future.” Daniel holds an MFA in interdisciplinary digital media from the departments of Film, Dance and Theatre and the School of Arts, Media and Engineering at Arizona State University. He is the coordinator for the Public Digital Arts Certificate. Mike Gibisser (Department of Cinematic Arts) is a filmmaker and artist interested in navigating the indefinite lines between essay, narrative, experimental, and documentary work, often drawing together disparate subjects or time periods. Gibisser was a Lecturer in the Department of Visual Arts at the University of Chicago. He has presented work at numerous galleries and festivals around the world, including the International Oberhausen Film Festival, the Harvard Film Archive, Tony Wight Gallery, Block Cinema, the AFI Film Festival, the Images Film Festival, Sundance, the European Media Arts Festival, threewalls gallery, and Views from the Avant Garde in the New York Film Festival. His work has been features in Artforum, Variety, and Cinemascope, amongst other publications. Education: 2011 MFA, Moving Image, University of Illinois at Chicago, 2009 MA, Visual and Critical Studies, School of the Art Institute of Chicago 2003 BFA, Film, Emerson College. Exhibitions include: ISEA 2012, ISEA 1997, Chicago; International Festival of Electronic Art 404, Basel, Switzerland and Trieste, Italy; Tweak, Interactive Art & Live Electronic Music Festival, Limerick, Ireland. Other local and regional exhibitions include: SpotLight, Elmhurst Art Museum, IL; Objective/Subjective: Mapping, NIU Art Museum, DeKalb, IL; Conflux, Pearl Conard Gallery, Ohio State University at Mansfield, OH; KY.7 Biennial, Lexington Art League, Lexington, KY; Altered Landscapes, solo exhibition, Moraine Valley Community College, Palos Hills, IL; Fassbender Van Straaten Gallery, Chicago; The Rockford Midwestern Exhibition, Rockford Art Museum, Rockford IL; Soap Factory N.N.E., Minneapolis; Betty Rymer Gallery, Chicago. Mentioned in: Leonardo, “in::formation, The Aesthetic use of Machine Beings, Vol. 33.; The Chicago Reader “Technically Brilliant” by Fred Camper; Information Arts, Intersections of Art, Science, and Technology., by Wilson, Stephen. Awards; Faculty Enrichment Grant 2012 & 2008, SAIC; CAAP Grant; Herman Miller Art Award; Holland Area Arts Council Award. Kyle Rector (Computer Science) completed her PhD in Computer Science at the University of Washington during summer 2016. She is a recipient of the Google PhD Fellowship, National Science Foundation Graduate Research Fellowship Program, and the Google Anita Borg Memorial Scholarship. She conducts research at the intersection of Human- Computer Interaction and Accessibility, specifically working with people who are blind or low vision. She recently developed "Eyes-Free Art," a research project in collaboration with Microsoft Research. Using off-the-shelf Microsoft Kinect hardware, a visually impaired Museum visitor’s distance from a painting delivers a range of audio experiences. As a person moves closer they can hear more detailed information about a painting. From furthest to closest, the person hears background music, an interactive sonification, interactive sound effects, and a detailed verbal description. Bjorn Anderson is involved with the Levantine Ceramics Project, an archaeological database designed to gather ceramic research into a central, publicly accessible site. Peter Chanthanakone produces 3D animated short films displayed on various screens in public venues like Times Square in NYC and in film festivals. Bradley Dicharry uses traditional and emerging design theories and practices to provide creative solutions to local and regional nonprofit organizations. Steven Ungar teaches courses on visual arts, with emphasis on social documentary and essay modes in US and European contexts. 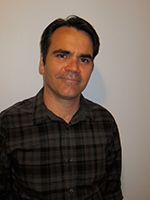 Juan Pablo Hourcade’s main area of research is Human-Computer Interaction, with a focus on the design, implementation and evaluation of technologies that support creativity, collaboration and information access for a variety of users, including children and older adults. Denise Szecsei is a mathematician who teaches a course on Dancing Robots. Michael Sakamoto is an interdisciplinary artist active in dance, theatre, performance, photography, and media. Nicole Grosland (Biomedical Engineering) develops and applies experimental and 3D computational models, primarily in the area of biomechanics, to address research questions in the musculoskeletal sciences. Eric Stone is a scene designer and website creator.